The web is a wonderful place for finding wonderful goodies! Here's a few honoring St. Patrick's Day. 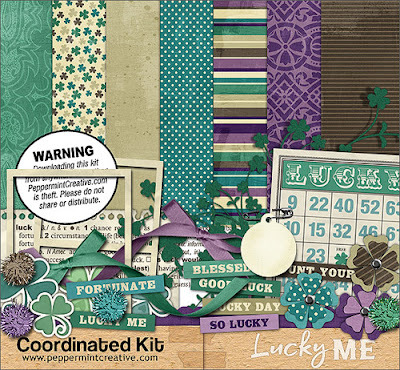 Here's a great coordinated digital kit called Lucky Me from Peppermint Creative. Whether or not your a digital scrapbooker, the colors and elements in this kit are just great. Use them entirely on your computer or print them out for use on your traditional layout. Are you a photoshop user? 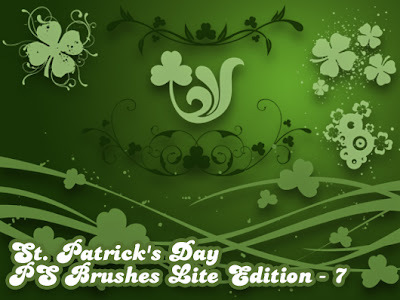 If so, here's a free batch of seven great St. Patrick's Day themed brushes from Graphics-Illustrators.com available for free download. If you want more, they also have an extended set of 35 brushes available for purchase. How about incorporating these cute printable cards from Living Locurto on your next layout? A slip one in your child's backpack with a special note on St. Patrick's Day? 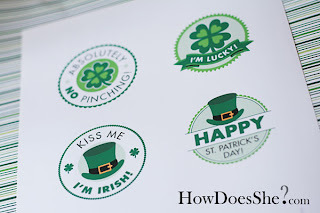 These St. Patrick's Day tags from How Does She? are just adorable! All you have to do is sign up for their free newsletter and they'll email you the download link. How about a new font for your collection? (Come on...admit that you collect fonts just about as much as you collect scrapbook supplies.) This one is called Kingthings Kelltika and is available for free download through FontSpace. Granted...you won't be using this one for journaling (please don't); however, it could be used for one stunning, themed monogram or short title treatment. Also, don't forget the St. Patrick's Day Word Art collection that I created to go along with the challenges included in the March :Be Inspired: Creativity Prompts. What's your favorite link above? 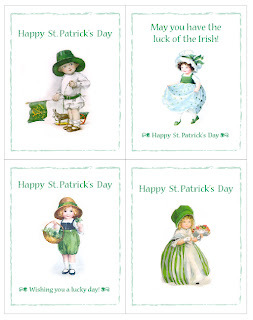 Have you found any other great St. Patrick's Day downloads or printables in your online explorations? If so, please share a link in the comments.